This thick, soft microfleece robe for men from Alexander Del Rossa is made from premium fleece fabric. Our 15 ounce polar fleece is soft, lightweight, and durable to keep you warm without weighing you down for years to come. Designed with you in mind, this luxury chenille robe is great for lounging around the house, hot tub, walking your property on a brisk morning, or even for use as a smoking jacket. Soft, lush, and rich in features, we trust that your purchase of this men's velvet house coat will not leave you disappointed. Looking for the perfect winter robe to wear with your favorite slippers? Look no further than this plush, fleece bathrobe as the perfect compliment to your house or spa, slipper shoe or sock. Looking for the perfect gift him? Look no further! He works hard and deserves a break - give the gift of relaxation father's day, Christmas or birthday with this dressing gown from Alexander Del Rossa. Whether for your elderly father, husband, son, or any other dad, we are confident that they will love this product and use it for years to come. Wash in cool water with like colors and Dry on low heat.We recommend using a light detergent and washing with other soft materials to keep your robe looking it's best. 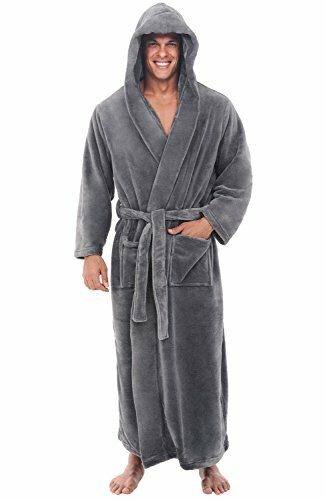 PLUSH MICROFLEECE ROBE - This premium 100% polyester 15 ounce microfiber fleece bathrobe is the softest piece of clothing you could ever relax in. Thick microfleece robes are warm and lightweight, making them comfortable in every way. WARM HOOD - The most loved feature on this classic men's bathrobe is the large hood. This water absorbent detail will keep your ears, neck, and head warm even on the coldest winter night. SAVE ON YOUR ELECTRIC BILL by turning the heat a little lower and wrapping up in this fluffy hooded housecoat. The only difference you'll notice is the velvet-like feel of fleece on your skin and the savings at the end of the month. GREAT AS A GIFT - A bathrobe is one of those warm familiar products that you didn't know you needed until you finally got one - which is why it makes the perfect gift for your dad, husband, son, or friend. We also have matching women's robes, which means you can buy two robes as a couples gift for your loved one's wedding or anniversary. If you are looking for a great gift for Christmas, a birthday, or other special occasion - look no further.